There’s no need to get on a plane this summer – you can get your fill of sun and sand right here in London. Here are five of the best urban beaches to check out, plus where to eat nearby. 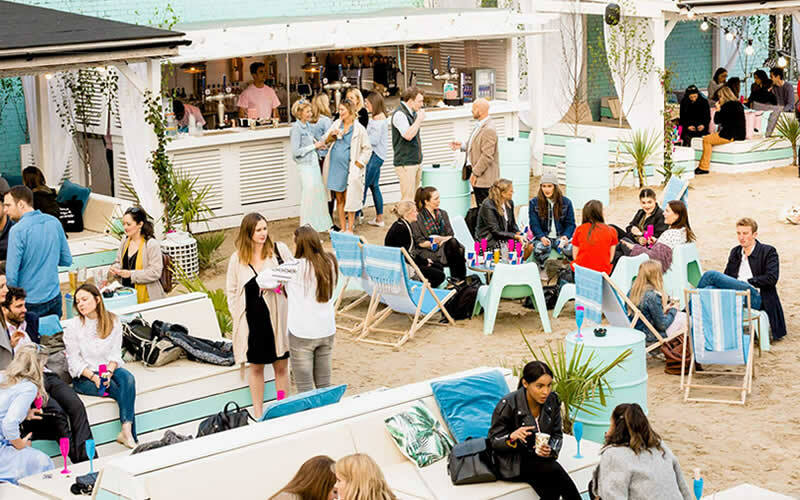 Now in its sixth year, the Urban London Beach has all the ingredients for a lazy summer day. 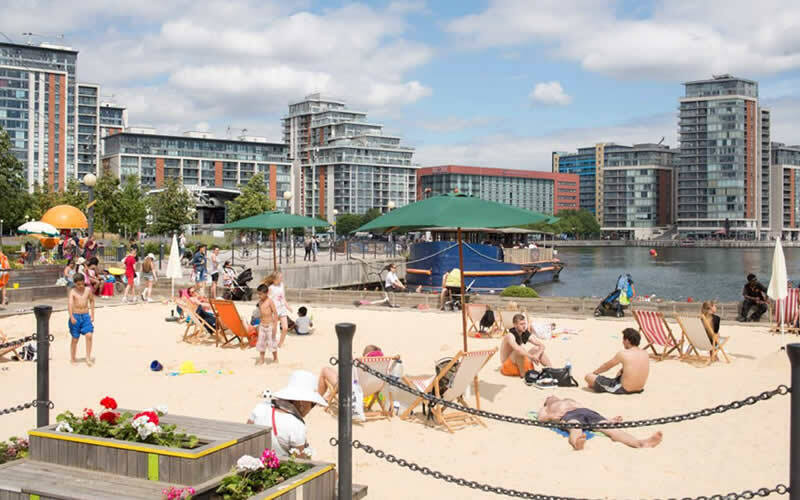 The huge patch of sand is perfect for sunbathing, but if you’re feeling adventurous you can try paddle boarding and wake boarding in Royal Victoria Basin. As the sun sets, grab a deckchair and a drink from the beach bar and enjoy the view across Docklands. The surrounding area is a little quiet but you can eat very well at the waterside Nakhon Thai. For more options, jump on the DLR to Canary Wharf for barbecue at Big Easy, tapas at Iberica, or modern Indian dishes at Chai Ki. 18th July – 2nd September. Mon-Sun 10am-8pm. Free entry. 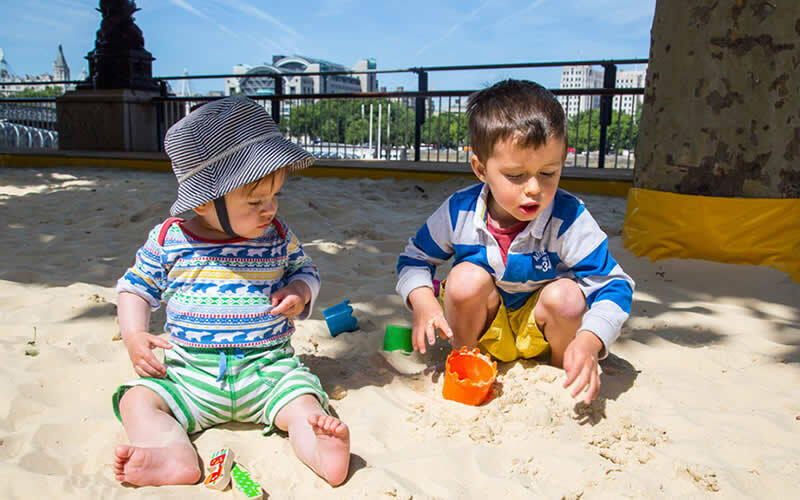 After a stroll along the Thames, you can catch some rays at the Southbank Centre Beach – 85 tonnes of golden sand right next to the river. Too hot? Grab a fro-yo from the neon pink SNOG bus or cool off in the refreshing spray of the Appearing Rooms fountain, created by Danish artist Jeppe Heins. Once the sun sets, there are outdoor film screenings, live music and DJ sets to look forward to. On the food front, you’re spoiled for choice. Grab a bite at House at the National Theatre, go for beers and burgers at The Green Room, or treat someone to a riverside supper at Skylon. At the weekend, you can try some of the best street food in town at the Southbank Centre Food Market – choose from pad Thai, pizza, cocktails, curries and more. 25th May – 9th September. Daily 10am-10pm. Free entry. Bringing Ibiza vibes to SW6, Neverland is a beach club paradise with golden sand, pastel cabanas, daybeds, and a cocktail bar. It’s not just for sun worshippers – there’s shuffleboard and ping pong, plus beach yoga, brunch, and DJs at the weekends. Food is available on site, courtesy of Jimmy’s BBQ Club and Pizza Shed, or you can hop in an Uber and head to local faves like Koji, PerBacco, and the Harwood Arms. 3rd May – TBC September. Wed-Fri 6pm-11pm. Sat 12pm-11pm. Sun 12pm-8pm. Entry from £5. 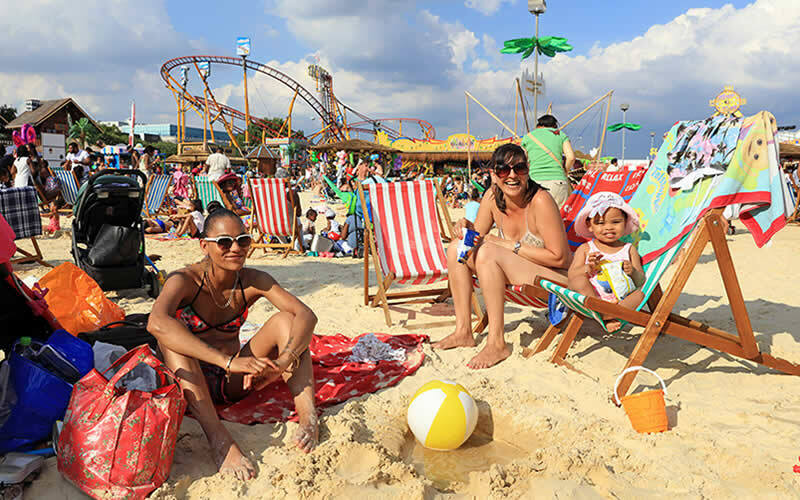 The beach at Brent Cross is back for another summer and it’s bigger and better than ever. As well as splash pools and a sandy beach, there are over 25 different rides for all ages to enjoy. Younger kids will love the bumper boats, slides and carousel, while grown-ups can brave the spinning coaster or Europe’s most extreme pendulum ride, the XXL. There will be plenty to keep the kids occupied throughout the summer, from circus workshops to Punch & Judy. Worked up an appetite? There are beach shacks serving burgers, fish and chips, and sweet treats, plus cocktails for the grown-ups. You can also head into Brent Cross Shopping Centre and dine at family favourites like Wagamama, Pizza Express, and Gourmet Burger Kitchen. 14th July – 2nd September. Mon-Sun 12pm-10pm. £3 entry. 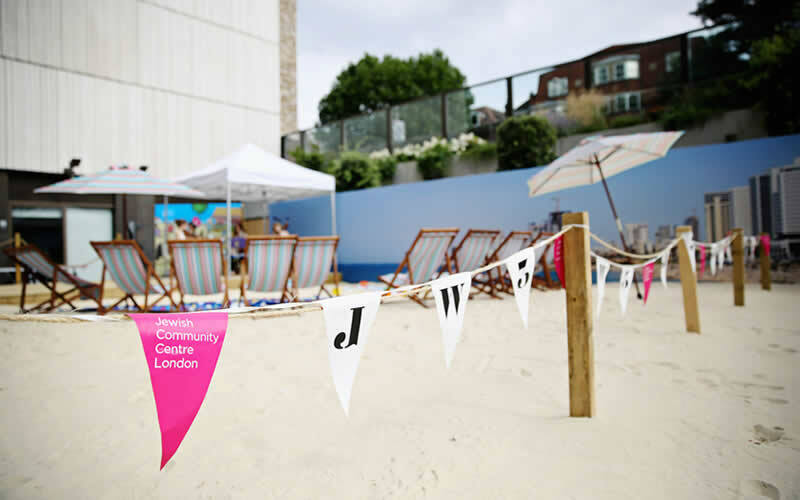 JW3, London’s Jewish community centre, is hosting a two-month beach pop-up, complete with golden sand, good food and cocktails. There are buckets and spades and a paddling pool to keep the kids busy while the adults soak up the sun. Food and drinks can be ordered from JW3’s modern Middle Eastern restaurant, Zest. Try the aubergine dumplings with Israeli salad or beat the heat with their watermelon and peach sorbet. 1st July – 2nd September. Sun-Thu 9.30am-8pm, Fri 9am-3pm. Free entry.